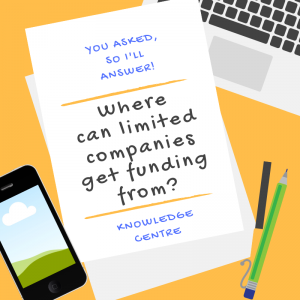 Where can limited companies get funding from? You asked, so I’ll answer – Where can limited companies get funding from? If you’ve decided to run your social enterprise as a limited company (either limited by shares or limited by guarantee) then you aren’t likely to be eligible for as many sources of funding as CICs (Community Interest Companies), and you’ll be eligible for far less than charities. But there are a number of places you can go to for funding and other support, including Incubator and Business or Enterprise programmes, as well as grants, loans and investment. There are also still EU funded programmes and grants available – mainly through Local Authorities, as well as some you can apply for directly to the EU. Local Authorities also tend to have grants for businesses that are planning to grow and/or employing more local people. You can apply to Unltd and School for Social Entrepreneurs to join their programmes which also provide some grant funding.